Aamras Puri is a delicious and very popular dish of summer season in India specially in Maharashtra and Gujarat. 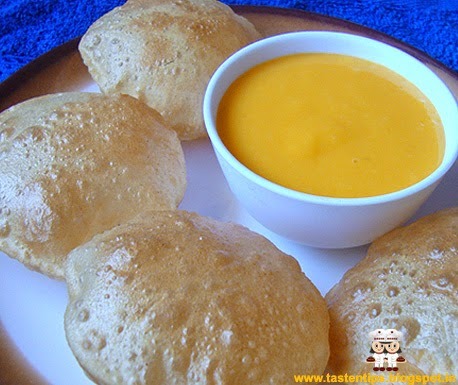 Summer season is incomplete without aamras puri. Aamras puri is a complete meal on its own. Aamras is made with fresh mangoes, pulp of a ripe fruit is extracted usually by hand. 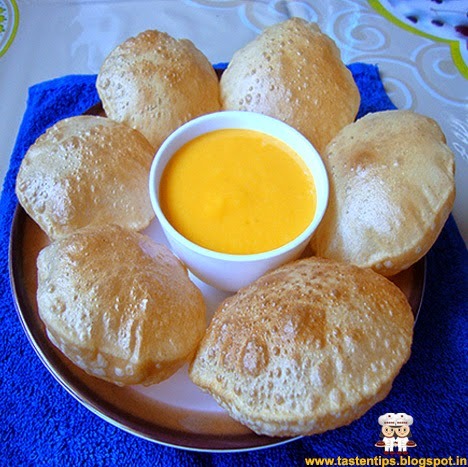 Sugar, ghee, milk and cardamom powder, also added to the pulp to enhance its taste and served with fried crisp hot puri. 1.Wash, peel & cut mangoes. 2. Add mango, milk, water in a blander, blend till get a smooth puree. 3. Transfer aamras in a bowl, add sugar if required and mix well. 4. Chill aamras in the refrigerator. 1. Sieve flour & salt. Add 1 tsp oil, mix well. 2. Knead it to a firm dough by adding enough water and keep aside for 10-15 mins. 3. Again knead the dough, make small balls out of it. 4. Roll each ball into small circles with thin-medium thickness. for other side. Drain puri on absorbent paper. 6. Repeat same process with remaining puri. 7. 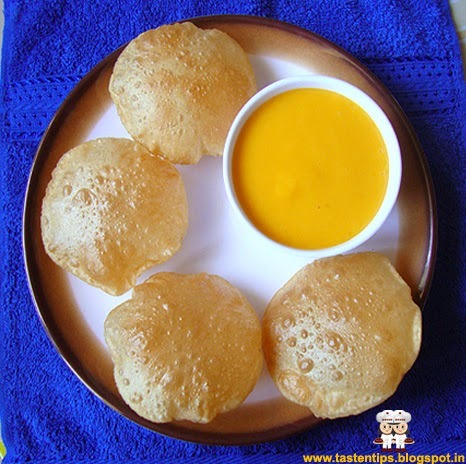 Serve crisp hot puri with chilled aamras. 2. For variation cardamom powder, saffron or nuts can be added to aamras. 3. Pure ghee can also be added to aamras to enhance its flavour. Delicious amaras puri love this combo. Thanks for visiting my blog, join the event then you will be eligible for winning. Never heard about this combo...Looks great! !